There are many steps that one can take to improve the value of their home, ranging from the simple and affordable to the extravagant and expensive. For this initiative we will be focusing on weatherization, something that can be done at relatively low costs and with minimal training. Though the value increase may not be as dramatic as remodeling a kitchen and installing all new appliances, it will make one’s home more energy efficient and comfortable while reducing utility bills. Some of the topics covered in this section, like window and duct sealing, will be covered in more detail on their own pages. Envelope sealing, also know as weatherization, refers to a series of improvements made to homes to increase their energy efficiency in heating and cooling. At the high end it includes things like installing new double or triple pane windows, but more often is limited to cheaper, but more effective tasks like sealing cracks around window and door frames with caulk and sealing leaky air ducts with mastic (a putty-like material specifically designed to seal air systems). Significant amounts of energy are lost in many homes simply due to uncontrolled airflow and often the time and effort taken to control it can result in significant savings in one’s energy bill. The process often begins with an Energy Audit or Home Energy Assessment, where a professional contractor will inspect a home, evaluating the quality of its insulation, heating and cooling systems, appliances, air ducts, and conduct a blower door test to determine where energy is being lost. 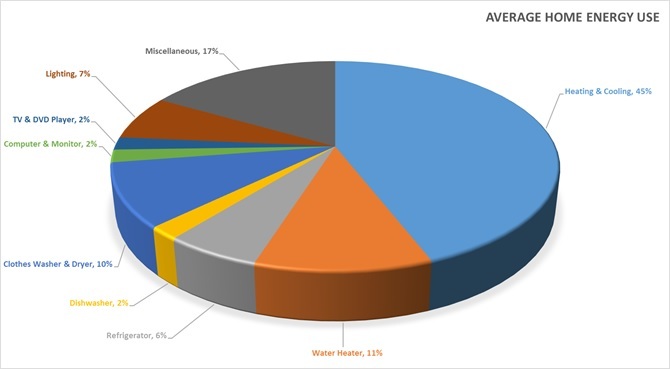 In the average Indiana home, 45% of its energy use is for heating and cooling. Depending on how and when a specific home was built and how well it has been maintained, this can be significantly higher. Older homes in particular can be extremely inefficient as the often have far less insulation than what is now standard, single-pane windows, walls and doors the freely leak air, and old inefficient heating and cooling systems. All of these are costing the homeowner money. By weatherizing one’s home, adding insulation where needed, sealing leaking ducts, closing gaps in window frames, and filling in unseen holes in walls and foundations, one can potentially save a significant amount of money on their utility bills every year while making their home a more comfortable place to be. A contractor isn’t needed for everything. Someone who is handy with basic tools and home improvements can do a significant amount of work for themselves. 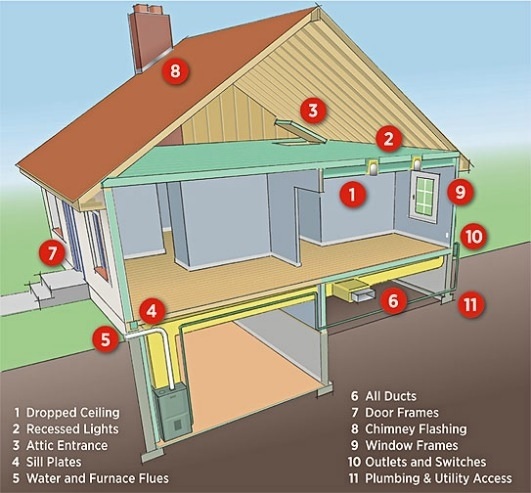 The U.S. Department of Energy has some very good guides on on how to spot air leaks, sealing air leaks, and a variety of other related topics. Their Energy Saver website is well worth exploring for tips on how to improve one’s home’s energy efficiency. Where can I get Assistance With Weatherizing my Home? The first thing one should be aware of when considering weatherizing their home is that there is often assistance available from various federal, state, and/or local sources as utility providers. This assistance is often income based and can cover up to 100% of the costs of the weatherization upgrades. For Indiana the agency that runs the program is the Indiana Housing & Community Development Authority and their Weatherization Assistance Program. For the individual homeowner though, the state weatherization assistance program is managed by Interlocal Community Action Program, Inc. or ICAP. ICAP can be contacted by phone at 765-529-4403. In addition to government programs, utilities like Vectren and Indiana Michigan Power & Light have home weatherization assistance programs. Through these programs Vectren and IMP&L may provide both professional and financial assistance to homeowners who wish to make their home more energy efficient. Contact information for both Vectren and IMP&L is provided below.